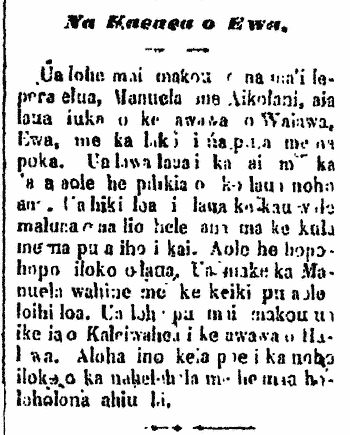 I am going to take a short break from posting new articles while i work on a project slightly related to the Hawaiian-Language Newspapers (and that i actually get paid for!). Will be back at least by the beginning of next week. Meanwhile, maybe scan over the past year and four months worth of articles, and maybe you will come across some that interest you! Jack Kaleiwahea falsely accused? 1893. Some Explanations pertaining to his arrest. Kaleiwahea has been a kamaaina of the uplands of Kalihi for many years. He has some blemishes by his eyes and mouth. While he was living this way, he was made an adversary by some people and they went to the Board of Health as witnesses saying he had leprosy. A warrant was issued for his arrest and he was captured and taken to the quarantine station of Kalihi. He told some people that he was confined there for six weeks without being examined, along with some other patients. One day some people told him that he was going to be taken to Molokai without being examined. Therefore, one day a thought grew within him without considering the power of the Board of Health, and thinking of his own accord that he did not have leprosy, he escaped and ran away to free himself and went to the mountains, until the valley of Waimea. Later it was heard that he fled, and the order was given to the Deputy Sheriffs in response to his escape, to capture him if found. He was constantly hunted like a wild animal. He said that he didn’t want to be taken alive. Previously, he did not carry weapons, but after he heard that he was being hunted by the officers, he ran and swam in the ocean, while being chased by officers aboard a canoe, and when the officers were close behind, he grabbed on to the outrigger float [ama] and flipped the canoe, and the officers were thrown into the ocean. The two officers returned to shore without the object of their chase. When it became dark, Kaleiwahea came to shore at Waialua. From that time, Kaleiwahea was seen carrying a rifle and other weapons, and when the officers came to arrest him once more, he was prepared. The officers told him that they’d come at night to capture him, so he fled to live in the mountains. He said that as long as he was hunted like an animal, he’d not give up. According to some news received, he was living in a very good area in the mountains of Kahuku, where it was better than where Koolau¹ was living, and he could toy with all who appeared before him. When he heard that he was to be captured again, he fled to the mountains, even if just a few months ago he was living by the sea and working at the dock of Waimea. He was very skilled at that kind of work. But he surmised that the order was given to the District Sheriffs of Waialua and Koolau, not to arrest him, but to let him be until the time was right, then maybe he could be assuaged and his appearance could be looked at. Because according to the people who knew, there were no signs of that disease that separates families [leprosy] upon him. I received your letter of aloha, and it gave me much hope and happiness, and for the first time, I’ve have an appetite here in my mountain home. I’ve received a lot of news that I’m being hunted after, and last week I was greatly saddened upon hearing that the haole police were coming along with the government troops to go against me, and that they’d shoot me if they can; what is the wrong I have committed that I should be treated that way like an animal? When I heard this, aloha welled up within me for my wife and our newborn baby of two weeks, as well as for my family. I attempted to go once again and escape my mountain home and give my wife and family my last aloha; and to my wife i said, “The time has come for me to go like a wild animal and return to my mountain home, until i meet with those of which I hear, and it will be then that I fight for life or death, until the very last puffs of smoke from my rifle.” With these words above, I left my home depressed, but when I received your letter to me, it gave me good hope that there will be end to the years of persecution. I shall rest like a man, and my deed done as a man, and not like a beast running through the forest. ¹The famous one written of in “Ka Moolelo Oiaio o Kaluaikoolau” or “The True Story of Kaluaikoolau,” which is available from the Kauai Historical Society, or a bookstore near you! Ka Lei Momi Oili Pule, Buke I, Helu 1, Aoao 5. Augate 5, 1893. Leprosy patients on the run, 1893. We have heard that the two leprosy patients, Manuela and Aikolani are in the uplands of Waiawa valley in Ewa, and that they are stocked with guns and bullets. The have enough fish and poi, and they have no difficulties with their living situation. They can just get on horses in the fields with their guns and go down to the sea. They have nothing to worry about. Manuel’s wife and child died long ago. We also hear that Kaleiwahea was seen in Halawa valley. How sad for these people living in the forests like wild animals. Ka Lei Momi (Oili Pule), Buke I, Helu 1, Aoao 5. Augate 5, 1893. Just noticed a notice quietly put up last week–All 16,000 pages are uploaded and word searchable? 2013. Its not perfect yet as they are still working out the kinks and a streamlined method to allow volunteers to continue online editing and we will update the site when new announcements are available. Mahalo nui! Harry C. Chang to Hattie Kuulei, Feb. 8. Douglas R. Mossman to Elizabeth Hugo, Feb. 8. Ah Hoon to Lucy Paliuli Kapono, Feb. 14. 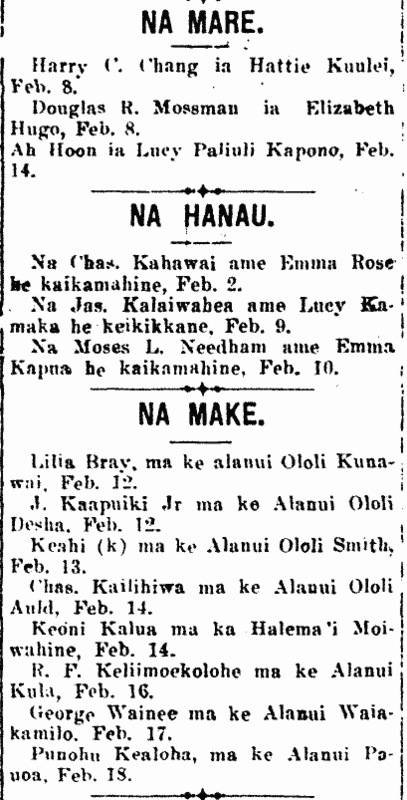 To Charles Kahawai and Emma Rose, a daughter, Feb. 2. To James Kalaiwahea and Lucy Kamaka, a son, Feb. 9. To Moses L. Needham and Emma Kapua, a daughter, Feb. 10. Lilia Bray, on Kunawai Lane, Feb. 12. J. Kaapuiki, Jr., on Desha Lane, Feb. 12. Keahi (m) on Smith Lane, Feb. 13. Charles Kailihiwa, on Auld Lane, Feb. 14. Keoni Kalua at the Queen’s Hospital, Feb. 14. R. F. Keliimoekolohe, on School Street, Feb. 16. George Wainee on Waiakamilo Street, Feb. 17. Punohu Kealoha, on Pauoa Street, Feb. 18. Ka Nupepa Kuokoa, Buke L, Helu 8, Aoao 8. Feberuari 21, 1913. 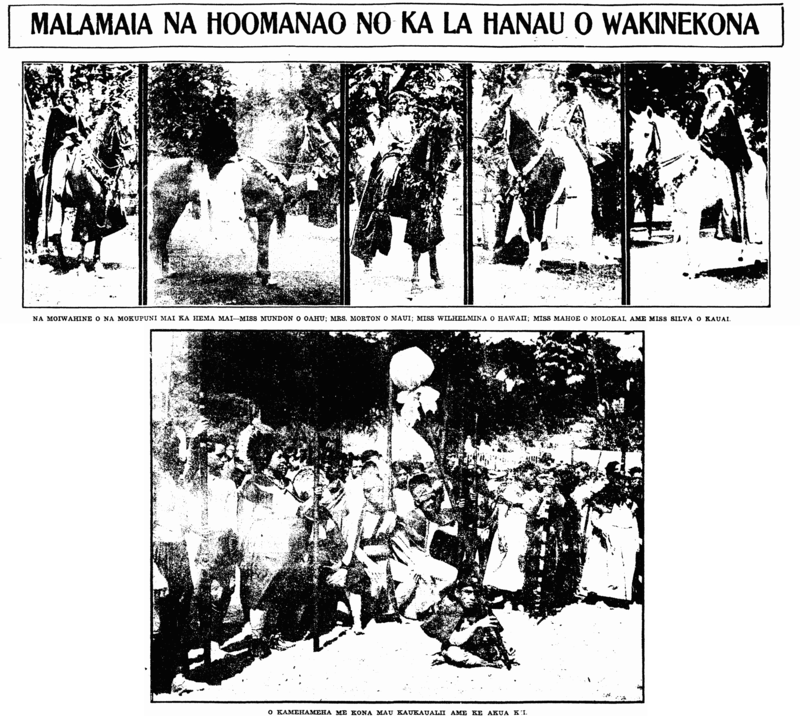 Reenactment of Kamehameha’s landing on Oahu, 1913. Some people of Hawaii of these new generations have committed to memory the arrival of Kamehameha the Great to Oahu and his landing in Waikiki, without however having witnessed it; today, at ten in the morning, it will be seen in Waikiki a scene very similar to that arrival of the war canoes of Kamehameha with the greatly distinguished King Kamehameha the Great sitting aboard his double-hulled canoes [waa kaulua] along with his war leaders, the chiefs, and warriors supplied with war implements of all sorts; King Kamehameha is adorned with a feather helmet [mahiole] and feather cloak [ahuula] along with a barbed spear [ihe laumeki] in his hand. This is the first show of this type done here on Oahu; there was not one from the beginning; therefore, it is something new worth going to. The preparations for and supervising of this great work is under John Wise, one of the people of this time that has memorized the history of Hawaii and the way of life of the people of old. From amongst the waa that are being brought to show this day, is one of the huge, old waa; it is said that it belonged to Kamehameha the Great and is being brought from Kailua, Hawaii, from the estate of Prince Kalanianaole. It is said that this a huge and deep canoe, and the depth reaches the waste, and it is something new to see a huge waa of the old times being used these days. Ka Nupepa Kuokoa, Buke L, Helu 8, Aoao 5. Feberuari 21, 1913.